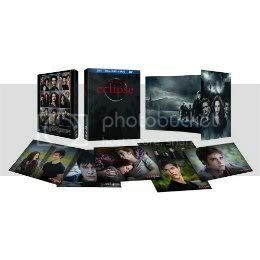 Eclipse DVD and Blu-ray details are starting to come in and we’ve got all of your special edition break downs! (More will be added as they become available, so be sure to check back here). Please note that the details are subject to change this far ahead of time, but more info will become available the closer we get to a release. 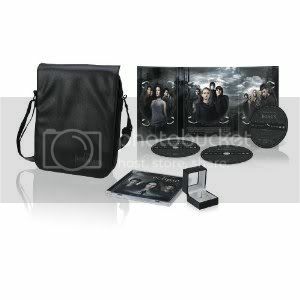 Includes special exclusive packaging and six photo-cards, plus the 2-disc standard edition of the movie. No details yet (maybe just packaging?) $24.99 @Best Buy. I emailed Best Buy and they told me that as far as they know, it’s just exclusive packaging included with the 2-disc edition, but that could change as we get closer to release. The store is also offering a special deal on Bella’s bracelet when you purchase the DVD. Walmart will be offering the regular DVD and Blu-ray editions of the movie, as well as a combo pack that includes the documentary Destination Forks . Pre-order this combo pack here @ Walmart for $24.96. Special fan packs will also be given out during the midnight release parties. “Destination Forks: The Real World Of Twilight”: Over 250,000 fans have made the pilgrimage to Forks to breathe in the reality that inspired Stephenie Meyer’s epic saga – have you? 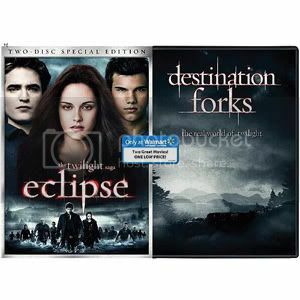 “Destination Forks” is a must-have for any “Twilight Saga” fan. Divided into three segments: “Twilight Tour”, “Moods of Twilight”, and “Twihards”, each segment is a unique journey that takes you deeper into the real world “Twilight” universe. In “Twilight Tour” cruise through the actual streets of Forks, Washington stopping at the real sites, homes, and businesses as highlighted in the Saga. “In Moods of Twilight” take a virtual walk through the mystical woods, mountains, rivers, and other gorgeous locations of Forks and La Push. In “Twihards” travel around the globe and meet the real life people that make up the greatest fan community in the world. 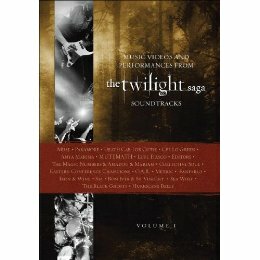 A special music DVD featuring performances from the Twilight films will be available on the same day as Eclipse (Dec. 4). Check out all of the details over at Amazon. This unprecedented release features a collection of music videos and live performances from bands featured on the chart topping soundtracks from The Twilight Saga: Twilight, New Moon and Eclipse. Connect with the artists as they perform the songs that channel the emotions of Twilight fans through music. Enjoy never-been-seen original music videos and live performances all on one release. You can pre-order the DVD here at Amazon! 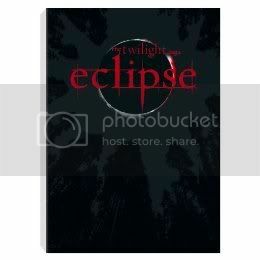 There will also be a limited edition steel case collection of all three films, Twilight, New Moon, and Eclipse, available on DVD (£17.99) and Blu-ray (£27,99). 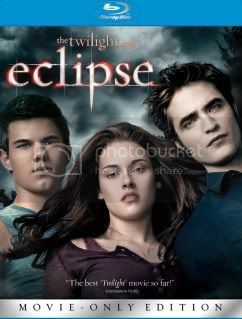 HMV is offering three special DVD sleeves featuring Edward, Bella, or Jacob (£12.99). Special edition (thanks Nikki!) with special packaging and bonus bag and ring. Details here @Amazon (€49,98). 2-Disc Edition (169kr, no pic yet) details here! 3-Disc Limited Edition (299kr) details here! Extramaterial: – 40 minuter från Twlight Fan Event i Stockholm! Not much info yet, but the price is around R140.00. Click here for more on the DVD. Sanity is offering an exclusive bonus disc when you pre-order the 2-disc version of Eclipse on DVD ($34.99) or Blu-ray ($39.99). Click here to view the details! JB Hi-Fi is offering the regular one and 2-disc editions, along with a 3-disc limited collector’s edition ($44.98) that includes photo cards from the film. 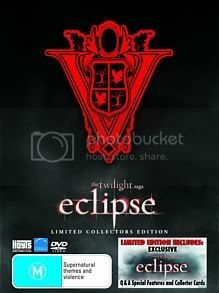 Eagle DVD Shop will be offering one, two, and three-disc versions of Eclipse, all of which you can check out here! Eagle will also be offering the set of all three films, which you can view here! Why do Germany and Japan already know the release date of the Eclipse DVD and here in U.S. there has been no release date set yet. How can this be? Why is it like this? If they can get the dvd in these 2 countries, then surely we fans here in U.S should be able to know when the dvd will be released here. Hey why don’t have the America one?? And when will it come out? Also I hope Americas Dvd comes out before everyone else. 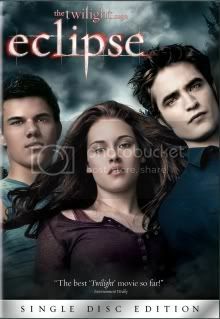 I’ve heard that the Eclipse DVD will be released on October 30, 2010 in the U.S.A. THE JAPANESE DVD IS NOT CORRECT, THAT IS A DVD OF INTERVIEWS/ETC. FROM THE US PREMIER IN LOS ANGELES, THE ACTUAL MOVIE ISNT EVEN IN THEATRES YET AND THAT DVD COMES WITH A TICKET TO SEE THE MOVIE. IT COMES OUT IN THEATRES THIS NOVEMBER. A DVD WILL BE UNLIKELY FOR A WHILE. – just make sure you know what your buying and i can speak japanese. dont buy that dvd thinking its the movie because its not, its an incentive to get you to go see the film this november and includes a ticket to the film in theatres, for roughly 30 bucks you get a dvd of the premier in los angeles ca, and a ticket to the film. 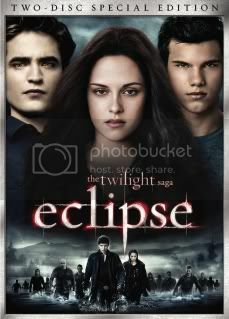 the eclipse dvd release date is set for december 4th. i believe i read that on twiight lexicon. I am hoping that myself, too!! I own the first two through them and I would like to keep my collection the same. i looked on their website and it looks like they only have the regular version for pre order. I think I am going to have to buy it at target. Which kind of stinks! What r u talking about? We have tons of twilight. Unless uv bin living under a rock. BTW, I AM from SA and I dont quite believe u.
Yea I’m wonderin the same thing. I ordered my twilight and new moon from borders but I don’t see a exclusive for eclipse. Targets looks like my others but I would rather buy through borders to be safe. Just so you all know. 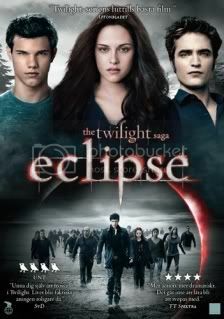 I just checked and the release date for eclipse In Germany is on the 10th of December *whoop whoop* I can not wait!!! Apparently Eclipse will be released on the 6th December. But you can order it online at take2. They have in stock now. I am so psyched to get it… To bad it will be another full year till we get to watch BReaking Dawn. South African release date is the 6th not 17th. Price: R149 for single disc, and R159 for 2 disc edition. It looks like special features will be a lot like the Us version. Log in | 59 queries. 1.077 seconds.